Shipping and courier services in the MENA region have been on the up and up for quite some time now. Gone are the days when your parcels are in courier purgatory, where you’re unsure whether whatever you’re sending will make it in the next week (or month). That said, there’s still a hurdle for the industry: e-commerce. While the region’s e-commerce industry is growing, it could always use an extra push here and there. 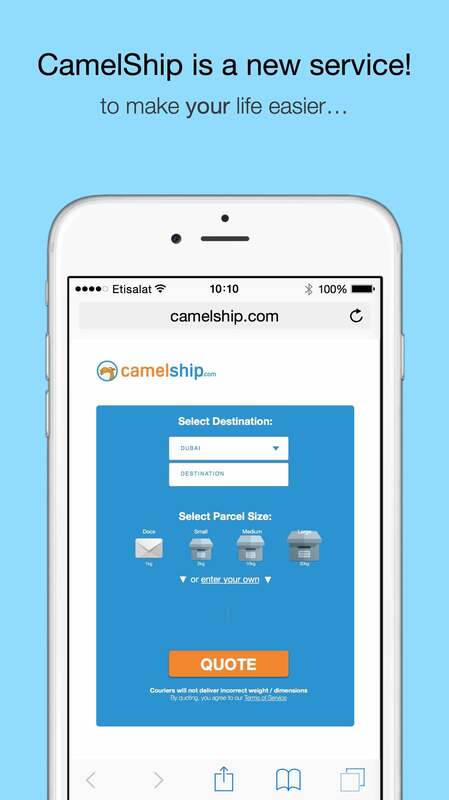 For courier businesses trying to maximize their customer base in the UAE, this is where CamelShip comes in. Former MiddleEat co-founder, Sari Issa, and former member of Aramex’s Amman-based GSO operations team, Fares Nimri, built CamelShip after they noticed a gap they could “bridge” in what they describe as the “e-commerce space.” Their solution? An online platform that makes “shipping cheaper and easier.” The duo come from different educational backgrounds that equipped each of them with unique skillsets: CamelShip CEO Issa holds a BA in Digital Branding from the University of the Creative Arts in the U.K., and COO Nimri holds an MBA from Carnegie Mellon. The co-founders say that CamelShip always kept customers involved during product development, even at its earliest stages. They used their target audience’s feedback to “optimize the user experience.” Smart move. Despite not having any angel investors, Nimri and Issa applied what they learned from the Lean Launchpad course, which they claim “has tremendously cut down costs.” Other than limited capital, they faced some technical challenges, namely connecting and integrating the different APIs of the partnered courier businesses into their system. They gave credit to their development team, calling them extremely hard-working, who were able to work around that obstacle and rise to the challenge. And how many people are on staff in total? CamelShip currently has a small team of five individuals who are currently covering all of the bases. Going forward, CamelShip hopes to expand to new markets in the MENA region, something that the duo is quite excited about. Considering that 75% of their users are Dubai-based expats, with the remaining 25% comprising of mostly expats in Abu Dhabi and Sharjah, I think it’s safe to say they could be looking into another GCC country with a multinational population. What about mobile and tablet apps? Negative, but that’s okay because the duo take into consideration that 80% of their customers are using CamelShip from mobile devices. The co-founders explain, “We strictly design [our website] responsively for mobile first.” CamelShip is a full-time priority for Fares Nimri and Sari Issa. So even though they won’t be active in other endeavors anytime soon, you’ll be sure to find them at startup events in the MENA region. Both credit ArabNet, STEP, and other conferences as contributors to their “vision and networking” in the region. See why it pays to participate in the entrepreneurial ecosystem? It’s exposure for your business both to other entrepreneurs, and potentially, a place to meet startup-friendly press.